I would just like to say thank you to Sean from Pencils and Music. He told me about several auctions where old Graf von Faber-Castell items were offered that are no longer available …and as you can see I managed to be the winning bidder for some of these items. 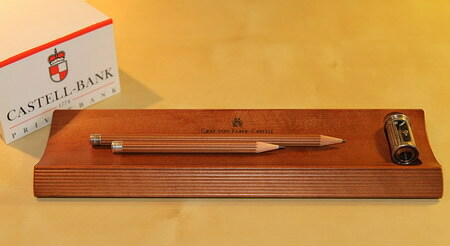 In case you wonder about the Castell-Bank paper block and paper clip holder: They are promotional gifts from the “Fürstlich Castell‘sche Bank”, a bank that belong to the Castell-Castell and Castell-Rüdenhausen branches of the Castell family. I had the paper block and the paper clip holder since the 1980s or the 1990s, so I doubt they are still available. The Faber family, manufacturers of pencils, and the Castell family, one of Europe’s old noble families with roots going back to the 11th century, crossed paths in 1898. You can find more information about the Castell family in the Faber-Castell Topics newsletter 1/2008 and on the history pages of the Faber-Castell web site. There is also a Castell-Castell family vineyard that seems to be quite ancient. I would buy a bottle if I could! Stephen, thank you for your kind comment. The GvFC items look really good. The items from the first photo are in my office and so far everybody who has seen them has commented how good they look. 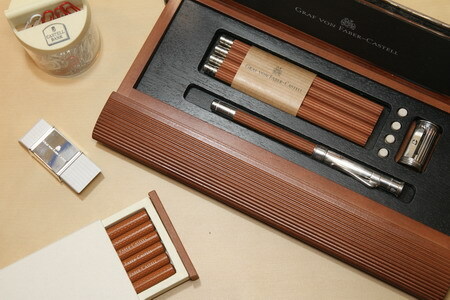 hi, i recently got a graf von faber castell pencil set from a state sale that, and i want to know if you can help me find more information about it and if you know more or less the value of it. the case is made out of wood i painted black with a silver or silver plated lid , it has a black pencil with what it looks like silver extension and four spare pencil that have a silver cap on each one of them, a heavy sharpener that also looks like silver, four holders for eraser but one eraser is missing, over all it look in good condition but i think it could use a good polish. please let me know if you need more information or a pic. thank you. It would be interesting to know how much you paid. A few years ago you couldn’t get this set for less than €100 (~ $130) in Europe. These days you will probably struggle to find it for less than €200 (~ $260). Both prices for a used set with minor marks / scratches. Prices in the USA might be different. It is the old silver-plated version as a set. The newer version has a built-in sharpener and is platinum plated, but not available as a set any more. Both, the old and the new version were available in black or in ‘normal’ cedar colour. The sharpener is also still available, now platinum plated, too. The price for the sharpener alone is £75 (~ $120) in the UK.